Celebrate your new business and maximize your marketing dollars with Chamber multi-media products. Chamber marketing options include the Chamber’s print and digital event calendars; press releases, news posts, and blog posts in the Chamber’s local news module; ROS banner ads for desktop and/or mobile editions; opt-in weekly subscriber eBlasts; the Chamber’s social media profiles including Facebook, LinkedIn, Twitter Google+, YouTube, Instagram, Tumblr, and Pinterest; materials inserted into new member welcome packages, and membership renewal invoices; sent to mailing labels to Chamber members; options for coupons, daily deals, classifieds, posts for job openings, text messaging, and buy local gift card programs. Ribbon cuttings should be scheduled at least three weeks in advance. For your convenience you may complete the ribbon cutting request form by clicking the link below, or contact the Chamber office at 760-744-1270 or via email: [email protected]. Once your request is received, the Chamber’s Membership Director will contact you to coordinate and verify date selections and pertinent details to help ensure your ceremony is as memorable as possible. Given the number of events the Chamber hosts and limited staffing, it is not always possible for Chamber staff to attend all ribbon cuttings; however to help us serve you better the Chamber does have an elite group of seasoned Chamber volunteers who are often (but not always, as they are employed in community businesses – either their own or others) available to help. The Chamber offers you many ways to get the word out, including free and paid options, but ultimately it is up to you to do any extra promotion. We always encourage you to invite family, friends, employees and local companies within your new business district, to your event. Please be advised that Chamber ribbon cuttings are hosted during the time frames shown below, as we try to be mindful of the demands on Chamber staff and volunteers. Times requested outside of these hours and days, may or may not be available, are approved by special request only, and may result in an additional fee. Contact the Chamber as early as possible, as additional time may be required to coordinate special requests. 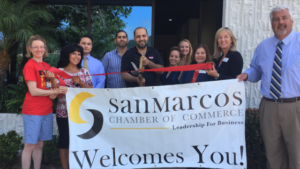 As a courtesy to you and with adequate advance notification, the San Marcos Chamber will promote your ribbon cutting in the weekly Chamber eBlast by including information about your ribbon cutting within the Chamber’s weekly news and event updates, in accordance with the package outlined below. Attendance at your event may also be more successful if you send out a personal invitation to family, friends, employees, and local companies within your new business community, asking for their help and support to your new business. The Chamber offers two pre-packaged ribbon cutting options. Choose your package below, then click here to schedule your ribbon cutting now. If you would like a customizable package, please contact the office with details. We’ll contact you with options and fees. Optional Attendees: Chamber Staff. Volunteers (as available). Pre-Event in Weekly eBlast: (1) Post on Chamber’s Main Event Calendar with Ribbon Cutting Graphic for at least two weeks. Post-Event in Weekly eBlast: (1) Post with Ribbon Cutting Photo. Delivery to Up to 4,300 Opt-In Subscribers.